Molecular chaperones are proteins which help large molecules fold or unfold. Some help assemble or take apart other macromolecular structures. They do not occur in these structures when the structures go about their normal functions. The first protein to be called a chaperone assists the assembly of nucleosomes from folded histones and DNA. 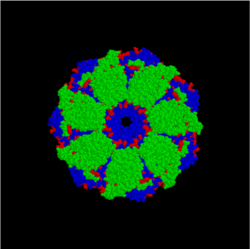 Those assembly chaperones, especially in the nucleus, assemble folded subunits into larger structures such as cell organelles. One major function of chaperones is to prevent polypeptide chains and assembled subunits sticking together in clumps which do not function. Some chaperones are "holdases" which act to stop aggregation. Others, called "foldases", do help fold proteins which cannot do it themselves. Such proteins violate Anfinsen's dogma. ↑ Ellis R.J. 1996. Discovery of molecular chaperones. Cell stress chaperones 1 (3): 155–60. ↑ Richardson R.T. et al 2006. "Nuclear autoantigenic sperm protein (NASP), a linker histone chaperone that is required for cell proliferation". Journal of Biological Chemistry 281 (30): 21526–34. doi:10.1074/jbc.M603816200. PMID 16728391. ↑ Alekseev O.M. et al 2009. "Analysis of gene expression profiles in HeLa cells in response to overexpression or siRNA-mediated depletion of NASP". Reproductive Biology and Endocrinology 7: 45. doi:10.1186/1477-7827-7-45. PMC 2686705. PMID 19439102. ↑ Ellis R.J. 2006. "Molecular chaperones: assisting assembly in addition to folding". Trends in Biochemical Sciences 31 (7): 395–401. doi:10.1016/j.tibs.2006.05.001. PMID 16716593. ↑ Kris Pauwels et al 2007. "Chaperoning Anfinsen: the dteric foldases". Molecular Microbiology 64 (4): 917. doi:10.1111/j.1365-2958.2007.05718.x. http://ultr23.vub.ac.be/ultr/pub/pdfs/290.pdf. This page was last changed on 21 September 2013, at 05:25.